Goals: To create a holy and healthy household! To inspire and motivate others toward knowing their "why"and achieving greatness. To challenge my comfort zone daily. Want to get Serious about your faith and fitness? Join me on the journey to total health by entering your email below and begin receiving my free inspirational instruction. I am Rebecca Dussault, born and raised in the Colorado mountains as one of three siblings. I started cross country ski racing at 9 years old and more seriously at 15, when I moved to the top of the sport very rapidly. I had many national victories as a junior. By age 17, I was racing around the world. I loved ski racing with my whole being and hoped to one day be an Olympian. At age 18, I graduated from Climbing High Homeschool and shortly after said "yes!" to my child hood sweetheart. I kept skiing for one more year after being married and then decided to decline full-ride scholarships to many of the Nation's top ski programs to join my new husband in the family business, true to my entrepreneurial roots. A year later, I decided to retire from ski racing to focus on my higher priorities in life. It was a very painful decision to step away from the top of a US sport, but it had to be done. I wanted to re-prioritize and break away from the spotlight. My skiing had become all consuming and carried with it a heavy burden of always being on defense about my faith and morals as I traveled the world with other athletes and coaches. However, after a 3 year break, during which our son Tabor was born, my husband and I began to discuss the possibility of me racing again. 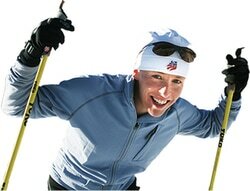 In February of 2003, I decided to enter a local college race in Crested Butte, Colorado. How I would do? I hadn’t been training hardly at all. The race was a 10km skate race and I found myself at the line with two time Olympian, Katrin Smigun. She was also undefeated in all her college races. When the gun went off I quickly found myself right on the tails of her skis. It wasn’t long before the two us were in a break away from the pack. The crowd couldn't believe it, neither could I! We exchanged the lead back and forth during the 25 minute race. All the while I was telling myself this couldn’t be true. I hung with her on the steepest climbs and she hung with me. The finish came down to a photo finish in which no one had a camera. It was never determined who won that race but I always said, “Tie goes to the local". This was the starting point for a serious discussion between my husband and I regarding my return to elite cross country ski racing. After a lot of prayer, and the determination to keep our family together no matter the cost, we came to the conclusion that it was time for me to enter the ski racing circuit again. God had given me a talent and he had given me another chance. So, here I was back on my skis training hard year round and proving to myself and to others that it is possible to live life to its fullest, being wife, then mother, then athlete. It was all a matter of God’s grace helping me prioritize and schedule my life so that I could accomplish all of my goals. In February of 2006, I accomplished my goal of racing in the Torino, Italy Olympics. My family and I had been preparing for this over the last 2.5 years and my husband and son were with me every step of the way. We traveled the world visiting countries like Norway, Finland, Italy, Germany, Denmark, Austria, Switzerland, France, New Zealand, Canada, Alaska and many U.S. states. Sharbel and Tabor did not miss a single race during my comeback, which was about 60 races! I have since raced as a professional in winter and summer triathlon, ski mountaineering, road bike and mountain bike racing. I love the feeling of competition, the drive and the challenge to become the better me each day. We now have five living children and one with the Lord. Even though I would love to keep racing and traveling around the world, I am currently focusing on other priorities, mainly my family and raising my children. I am also excited about Fit Catholic Mom and having a platform to share and inspire the Catholic mom and others about how to prioritize, balance and train in a way that glorifies the Lord. In health, happiness, and holiness.